New Year’s Eve isn’t appreciated enough. What’s better than a holiday dedicated to having a party, covered in lights, glitter, and other glitzy things? Nothing, I tell you, which is why I like to go all out for New Year’s Eve. Everything needs to be glitzy and over the top… even the drinks! That’s where this shimmery purple champagne comes in. Yup, you heard me right, not only is it the deliciousness of a classic bubbly, but it’s purple and it sparkles. What could ring in the new year better than that? For the rest of the ingredients, check out Tipsy Bartender‘s video below. The Viniq is what makes this cocktail so sparkly, but there’s a ton of flavor involved too. It’s a mixture of vodka, moscato, and fruity flavors. Mixed with the champagne and vodka, that’s a whole lot of flavor. That’s also a whole lot of alcohol, so you know it’s absolutely perfect for New Year’s Eve. 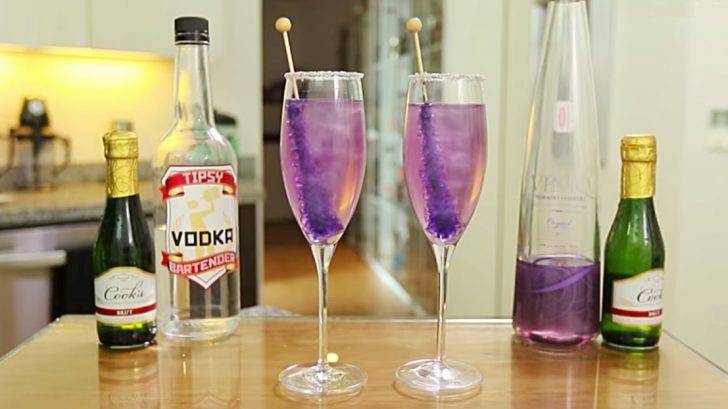 Watch Tipsy Bartender‘s video below to get an idea of how to make these, and make sure to do the garnish. It’s a drink everyone (of age) is gonna love!